Yesterday, we at SeatGeek begin our Midseason Ticket Report series by looking at the American League East. Today, we will be analyzing the American League Central. 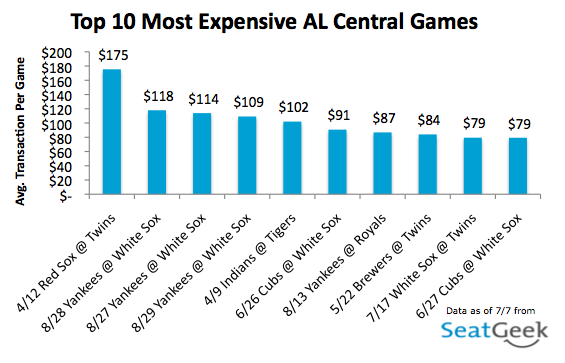 We will be using three metrics; 1) Average ticket price per team versus average percent of face value per team 2) the top ten games in the AL Central, as determined by average ticket price on the secondary market 3) the top three games for each team in the AL Central. Though the Tigers are in first place, the Twins are selling for an average of 198% of face value compared to the Tigers whose tickets are selling for an average of just 131% of face value. This could be partially due to the Twins playing in a new stadium, Target Field. 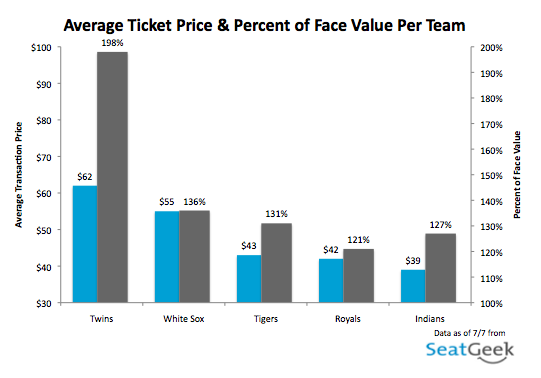 The last place Indians tickets sell for a higher average percent of face value than the 4th place Royals, 127% to 121%. The most expensive game was opening day for the Twins at their new field against the Red Sox. Incredibly, this game went for an average of 48% more than the next most expensive game in the AL Central. The White Sox are the home team in 5 of these games and play in 6 of them. No surprise that these games are against the Yankees and their crosstown rivals, the Cubs. 10 of the 15 top home games are games against the Yankees. This shows how large of a draw the Yankees are on the road. The only team to not have the Yankees in their top 3 was the Twins, who were swept out of the playoffs last year by the Yankees. Maybe fans are avoiding them? Be sure to check back with SeatGeek for the rest of our MLB midseason reports. Next up is the American League West. Also be sure to follow us on Twitter @SeatGeekMLB with any questions or comments.